Click on the image and be brought to a website that classifies Ecstasy and its multitude of indigence. Ecstasy is in its original form MDMA. Today most Ecstasy found on the streets may contain little to no actual MDMA but a combination of other drugs like Methamphetamine, cocaine, LSD, dog deworming medication, and many others. 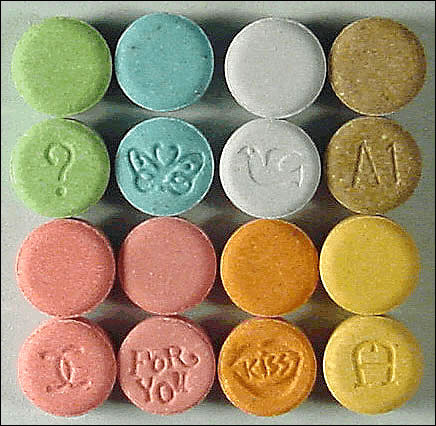 Most commonly Ecstasy comes in pill form but can also be crushed and injected or other ways. Liquid Ecstasy is actually GHB, classified as a depressant.